Whether you feel social media is a minor piece of your marketing mix or a significant part of your B2C business plan, you’ve likely at least accepted it is a must-have in your online selling toolkit. While only 33% of social media users in the U.S. follow brands (more on followers here), a whopping 47% of those say Facebook is the greatest influence on their purchases. Everything from passively observing products in friends’ posts, to clicking on a specifically targeted ad in their timelines can influence buyers’ decisions, and as such many consumers have accepted brands as part of their social media experience. Many businesses have accepted that reality as well. Facebook has added 10 million small business pages just this year. Instagram has launched clickable photos for advertisers. Twitter is testing its buy button. And, we now have the first completely shoppable social network, launched by an e-tailer no less. But, let’s take a step back. Only 33% of social users follow brands. What’s more, organic post reach (how much of a fanbase actually sees a brand’s social posts) has dropped from to 16% to just 2% in the last year thanks to Facebook’s 2015 algorithm update. Some users have started to skip over brand posts just as they ignore advertising in commercials and billboards. A whopping 47% of social media fans say Facebook is the greatest influence on their purchases. So the question is, how do you create meaningful social media channels that increase brand loyalty and, ultimately, influence purchase decisions? Despite never-ending algorithm changes, additions of social selling features and entirely new platforms altogether, creating and maintaining a true community around your brand still depends on one simple thing: social media authenticity. The social media landscape has changed a lot, but content and authenticity should remain constant. Developing your voice through honest and engaging storytelling is a natural way to build an authentic brand personality. Instead of simply posting product links and promotions, don’t be afraid to share content that inspires, motivates and informs. To do this, take on the persona of your ideal customer and think about what would make them hit that share button. For example, check out online store Josie Maran’s Twitter account. It is run by Josie herself and shares inspirational imagery, throwbacks to her early career days and even posts to crowdsourced product ideas. That community can get a sense of the life stories and events that inspire her makeup line and why natural beauty is healthy and important in today’s world –– and to Josie. In all, customers want a two-way dialogue with the real personality behind the brands, and this is a good thing. After all, it’s easier to be yourself than anyone else. Less advertising, less marketing and more honesty. That is today’s social media success story. Owning a meaningful online presence requires knowing what your fans want out of your social channels, and in turn, offering content that illustrates how your service or product fits into their lives. Unfortunately, according to Justin Foster, branding author and strategist at Foster Thinking, there is no scientific formula that proves what will and won’t work for your communities. Justin’s only three rules of social? Don’t be boring, don’t be stupid and don’t be a jerk. If a customer isn’t satisfied with their experience, they’ll go elsewhere. To keep fans interested, create content with high nutritional value that always informs or entertains your audience instead of just adding to the noise –– more people will amplify your content and as a result, help build your community for you. Take a look at the Facebook page of the denim and apparel store Rock Revival. 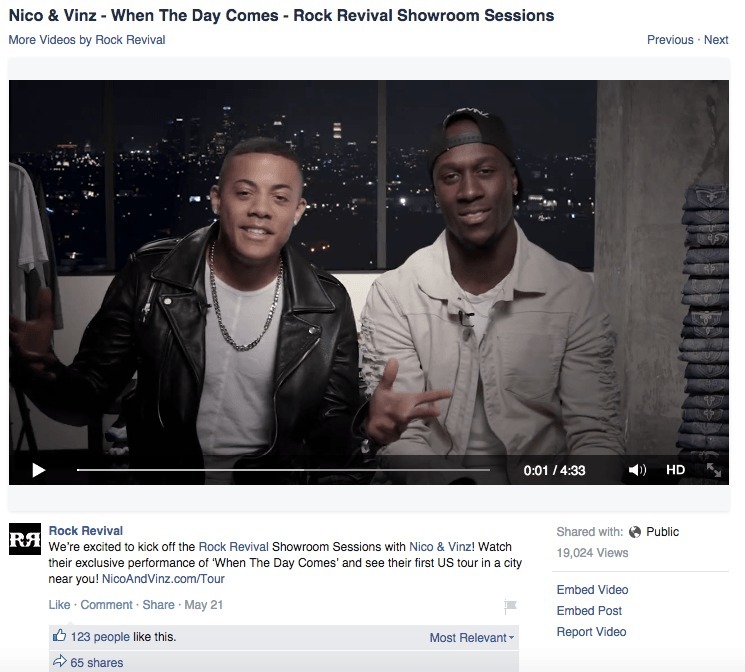 Scroll down the timeline and you’ll see their featured brand-sponsored “Showroom Sessions” music events, artist interviews and exclusive behind-the-scenes footage. They boast over 450,000 fans and high engagement metrics, especially comments and shares –– a strong indicator that fans find the content not only relevant to their lives, but interesting and share-worthy. An often fun, yet daunting, aspect of social media authenticity is allowing customer feedback and interpretation of your brand to help form the community. Sourcing inspiration from your own customers and influencers is a great way to fine tune your brand voice and keep a pulse on their content preferences. Metallic tattoo makers Flash Tattoos does a beautiful job of telling their brand story with photos, which are often user-generated or reposts of celebrity posts. The product is front and center much of the time, but the photos from all over the world are a narrative on the adventurous and independent women who wear them. Beyonce wearing Flash Tattoos at Coachella, anyone? Of course, not everyone can showcase pop stars endorsing their brand, so keep a close eye on photos, product reviews and comments your fans post. You could find inspiration for your next Instagram hit or customer testimony for your website. Plus, showcasing others’ content makes them more likely to become brand advocates because you made them feel special, heard and appreciated. Overall, be bold in telling your brand story and give your fans something they’ll want to talk about. Consider your end goal for social channels. Do you want to drive a few single purchases, or do you want consumers to embrace your brand as an integral part of their lives and potentially become loyal customers and brand advocates for many years to come? Personally, I’d choose the latter. Leah Spector is the social media marketer for Bigcommerce. Prior to joining the ecommerce industry, she developed her marketing skills for food and lifestyle brands at Cohn & Wolfe and the University of Texas at Austin.